I started these posts about Trinidad and Tobago back in January, and although I haven’t continued since February, there are still a few more places to visit from my must-see list for Trinidad and Tobago! Asa Wright Nature Centre is in the Northern Range in Trinidad, in the North-East-ish area of the island (it’s not all the way to Toco, which is the North-East peninsula, but just above the Borough of Arima). It’s a nature reserve in the mountains, originally comprising an old cocoa and coffee estate, which has been somewhat expanded over the years, so the reserve now comprises 1500 acres in the Arima and Aripo Valleys. 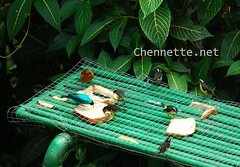 The Centre has a main house, restaurant, overnight accommodation and picnic areas for day visits. You call ahead to book a tour and guided hike through the forest trails, with the knowledgeable guides showing you the flora and fauna – we saw squirrels, bell birds, white bearded manakins, purple honeycreepers, corn birds, LOTS of hummingbirds, large lizards, and some semi-tame agouti! The main trail (Discovery Trail) they take all visitors on is fairly easy – going gently downhill (so unfortunately, the route back to the house is uphill, but gentle…). There are many other trails, but I think you have to arrange a special tour in advance for these…also if you are in a large group, school tour etc. But if you are really into eco-tourism and hiking through nature, I think you might want to look into a longer, more expansive hike/trail, so give them a call (or email) to find out what’s possible. I think I first went to Asa Wright as part of a UWI Biological Society visit in my first year on campus, where we did go beyond the main trail and passed over some streams and near a waterfall. That certainly is not on the usual path – although there are a couple waterfall rock pools within easy access which visitors are allowed to use. 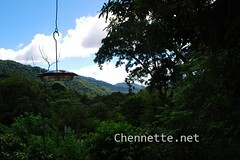 The Centre is a hotspot for birdwatching in particular, and the main house has the greatest verandah set up to see the birds…many species…not to mention the view of the mountains and valley! 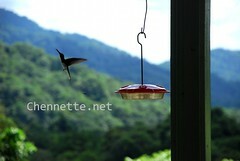 There are bird feeders strategically located around the verandah, and the hummingbird feeders are hung right around. The day we visited in December, there were 2 humingbirds in particular who had both set their sights on one particular feeder, notwithstanding the 5 or 6 other feeders around and the fact that there were no other hummingbirds around. So for the duration of our visit, we were treated to these 2, alternately commandeering the desired feeder, while the other waited on a nearby tree, and then swooping in fast to scare off the one at the feeder. Over and over and over. It did give me lots of chances to get some action shots of these super-fast birds though, plus the entertainment factor! Asa Wright has facilities for overnight stays, in the main house, or in cottages on the grounds. In fact if you want to see the oil bird habitat, you have to be staying at least 3 nights, since it’s an night trek, and they try to limit the number of disturbances for these birds. The restaurant is on premises, but if you are just a day-visitor you need to order a meal in advance. Otherwise you are limited to ordering food from the verandah bar (mostly sandwiches, but not bad at all). They serve coffee which they grow on the grounds (remember, a former coffee estate!) and make use of the fertile lands to have a kitchen garden for their restaurant use. As with any service, things are dependent on the people involved. My previous visits have all encountered super friendly and informative persons at Asa Wright. It was always a bit of a hassle to make arrangements in the days before cellphones and email as you had to call a number in Arima (no phones up the mountains) and wait for confirmations etc. These days it’s much easier although you still have to call or email the day before to book the tour/trail. They do normal tours at 10.30 am and at 1.30 pm, which is included in the visitor’s entrance fee. The day we were heading up there, we were early, until we hit unexpected and awful traffic in Maloney. Snail crawling through Arima. We called ahead to let them know we were running late but were trying to make it on time. The call kept dropping (which is why we weren’t able to reserve lunch) but at some point they told us, well the guide will wait for 10 minutes and then leave with the tour and we might have to be taken to catch up. Ok…no problem. I used my best skills to drive up the mountain and we got there JUST on time. Paid etc, went to find the guide and realised…it was just us for this tour. Only us…the guide would have been setting off on the trail all by herself? Small blip though, and the lady serving us our sandwiches afterwards was super nice. Even though we didn’t get our coffee. After our relatively short hike, we came back and limed on the verandah for a couple hours at least. I do know we were still there when people came for their 1.30 tour. It’s just so very relaxing to sit on that verandah and look out at the beautiful Northern Range mountains. One day, I think I must stay overnight to fully take advantage of that place. We had to leave eventually, since we had reservations for Tea at Mount St Benedict! All the way down this mountain above Arima and up the mountain above St Augustine More on that in the next post… (although you can see Chookooloonks posted about her visit there recently). This entry was written by Chennette and posted on June 26, 2011 at 5:01 pm and filed under photos, travel, Trinidad and Tobago. Bookmark the permalink. Follow any comments here with the RSS feed for this post. Post a comment or leave a trackback: Trackback URL. We’ve stayed the night there. It’s pretty basic in the room, but you don’t intend to spend much time in there anyway! 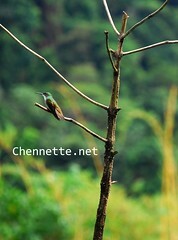 It was lovely to get up really early and go watch the birds on the verandah, sipping yummy coffee. BEST coffee ever, sorry you didn’t get any! And the food is really good.